E-Catalogs have gained popularity in tandem with the far reaching influence of the internet and the soaring popularity of smartphones, tablets other connected devices. An e-catalog can increase sales, reduce costs, and deliver the right products and services to the right users and clients. As consumers increasingly gravitate towards the online environment it is important to provide the consumer with a shopping experience that caters for their needs. An e-catalog can enhance your brand and offer shoppers an experience to match their online browsing habits. The purpose of today’s blog is to provide you with some inspirational ideas and examples for your digital catalog templates but just before you do I would like to point out some of the features that your digital catalog should have in order to be as accessible as possible and also to encourage engagement with the consumer. The main reason many of you are here today is to find some inspiring examples for your digital catalogs so, without further delay, here are some examples of digital catalogs you can assemble using the 3D Issue, the only restriction sis your own imagination. 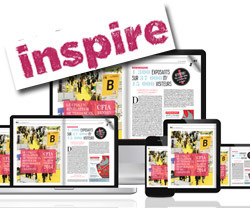 You can also view 11 Inspirational E-Magazine Design Ideas here as well as on our sample page. I hope you have found something of use to you in today’s blog and as always if you have any comments or thoughts you would like to add please do so in the comments section below. All samples shown today were created using the 3D issue software; complete the download form above and your publication could be side by side with the inspirational samples show today.